In a world that is always trying to mask a woman’s scent, it is refreshing to find beauty brands that are more about getting us to a healthy place, instead of trying to cover us up. 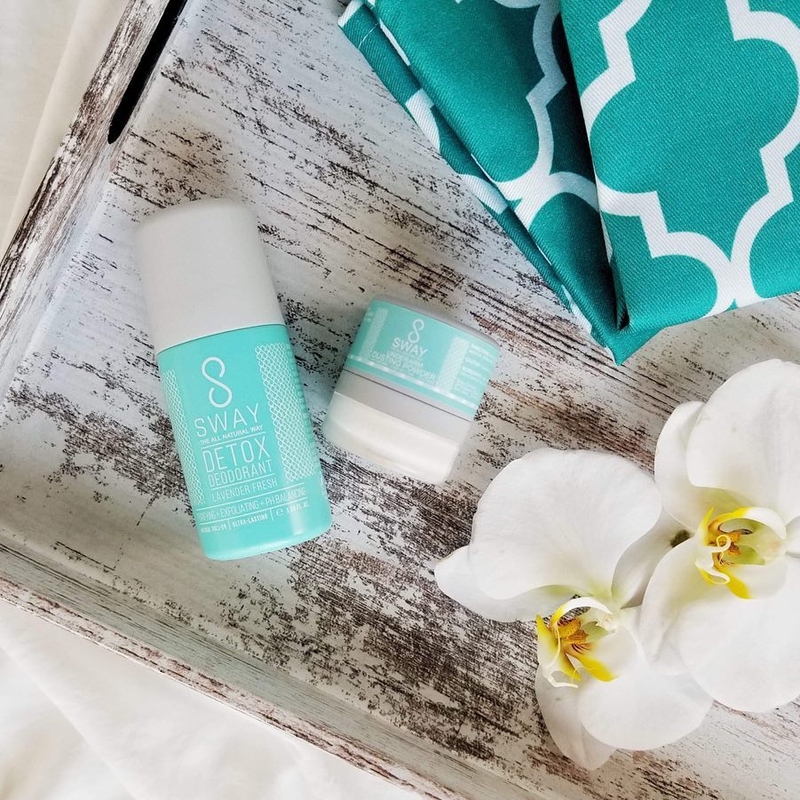 SWAY’s founder Rebecca So quickly learned the importance of a healthy underarm verses a product overwhelmed one, in her hunt for the perfect deodorant. The quest for a deodorant that doesn’t make you smell (either because it helps you, but also it isn’t too fragrant itself), doesn’t irritate your skin, and doesn’t make a mess of your clothing, is one for the ages. However, one shouldn’t be too surprised that SWAY’s answer was an all natural one. Please learn more in Jejune’s exclusive interview below with SWAY’s founder Rebecca So, and start finding ways to treat your underarms right! Please tell us how SWAY got started. I’ve struggled my entire adult life looking for a deodorant that worked. I even resorted to using those aluminum ones that literally burned my underarms, and I thought, no wonder you don’t sweat when you use these things because they pretty much just burn off your sweat glands! On top of that, they made my skin dry, flaky and discolored. And when I thought I finally found one that worked? It would all of a sudden stop working after a few months. And all of them would leave these embarrassing white marks on my clothes. I can even tell you one particularly embarrassing story. I’m a CPA so I attend a lot of networking events and cocktail parties. And I love wearing sleeveless dresses. At one particular event, I ran into a friend of mine. I walked up to him and gave him a hug. I stepped back and oh my, I just left two white imprints of my underarms on this guy’s dark suit. I was so embarrassed and horrified. It’s one thing to leave makeup on someone else’s clothes but to leave something from your underarms? So about 5 years ago, I decided to take matters into my own hands and literally created SWAY’s formula over my bathroom sink. But it wasn’t until 2 years ago that I decided to bring this to market. And it happened quite unexpectedly as well. I was at an audit fieldwork with a bunch of staff, cramped in the client’s conference room. And when you have so many of us cramped in a small room for 13-15 hours a day over a span of a few weeks, you start to get to know your colleagues on a very personal level. Somehow, our conversation drifted to body odor, and then deodorant, and then aluminum. And I was lecturing them not to use those bad stuff! But then they said they didn’t care, they just wanted something that worked. So I made some samples for them to try. And one thing led to another, that’s how SWAY was born. How long has SWAY been around? Why is natural deodorant so important? I fully understand why so many people keep using chemical-laden deodorants or antiperspirants even given the skin irritations and potential links to many health risks because like them, I simply needed something that worked. But even so, consumers are not happy with the most “powerful” and clinical-strength products on the market. Therefore when I created SWAY, I didn’t focus on creating a natural deodorant that worked. Rather, my goal was to create a deodorant that REALLY worked which happened to be an all-natural one! I tell people that SWAY is simply a deodorant that works, and the fact that it is all natural is another bonus. Why is it important to be aluminum and baking soda free? Certain research has linked aluminum to hormone imbalance, endocrine disruption, breast cancer, and even Alzheimer’s. But regardless of how strong the link is, it is healthier to just sweat it out. Sweating is good for you, as long as you don’t stink. And based on my personal experience and from feedback from many customers, many of these aluminum-based antiperspirants aren’t doing such a great job anyways. So when there’s a natural option that works, why not? Baking soda is found in a lot of natural deodorants because it helps neutralize odor and slows down growth of odor-causing bacteria. However, many people who switch to a baking soda-based natural deodorant often experience skin rashes, dryness, redness, breakouts, discoloration or even soreness. That’s because baking soda is very alkaline, with a pH level of almost 9! And when you apply something so alkaline to our naturally acidic skin (pH level of 5.5), it can create an imbalance and therefore causes damages to our skin. What made you realize that Apple Cider Vinegar would make a good deodorant? The reason I ended up using apple cider vinegar is actually quite accidental. I was suffering from adult acne at the time and nothing was working for my face. I decided to make a facial toner with ingredients I could find at home which happened to be apple cider vinegar and some other natural ingredients. And because I made such a big batch of the facial toner that I thought (don’t ask me why), let me try it on my underarms! Hey, if it was good enough for my face, it had to be good enough for my underarms, right? So I started applying the solution to my underarms and it worked! And apple cider vinegar as a deodorant ingredient makes perfect sense. It is a great skin exfoliator (dead skin cells harbor the growth of odor-causing bacteria), it restores and maintains the acid mantle, which is out skin’s natural barrier, it is well known for its anti-bacterial properties and it is 100% natural. Why is this better than other deodorants out there? Artificial and Natural? Aside from the fact that it works, it lasts, it is also absolutely residue free. Most natural deodorants are either in stick, solid, or paste form and are made with coconut oil, wax, or starchy ingredients. Not only do they ruin your clothes, they often leave a layer of residue on your underarms that is not so pleasant to touch (think romantic nights). And even with artificial ones that claim to be invisible, they often are not. And at shows and popups, we sampled our SWAY deodorant on attendees’ skin and 100% responded that it actually felt like nothing at all. Why is it important that SWAY restores the pH balance of your underarms? Our sweat actually doesn’t smell bad. It is the bacteria on our underarm skin that causes the foul odor. By restoring the pH balance of our underarms (remember that our skin is naturally acidic), we restore a healthy and balanced environment that limits the overgrowth of odor-causing bacteria. And once our skin’s pH has been adjusted and balanced, you might actually have less of a dependence on deodorant. In fact, let’s say you go to the gym, take a shower afterwards and you ask me if you need to reapply SWAY before your date night? I’d say no as long as you’ve adjusted your pH. But you ask me, “how can that be? I already washed off the deodorant!” My response is, with SWAY, there’s nothing to wash off. SWAY doesn’t work by masking the odor. It works by adjusting the pH to create an environment that slows down growth of bacteria. I personally can go on for days without using SWAY, but I still use it as part of my beauty regimen (underarm deserves some love, too). Why do you have a dusting powder that goes with the deodorant? SWAY is the only underarm care system that comes with a complementary dusting powder that gives you the powdery, silky smooth texture, very much like what a baby powder does, without the talc. It absorbs any lingering moisture from the roll-on. And for those who can smell the apple cider vinegar undertone in our roll-on, although it will dissipate on its own, the dusting powder will definitely take care of that. But we do recommend letting the roll-on work its magic (pH-balancing) before dabbing with the dusting powder. What is the difference between your men’s and women's deodorant? They are both effective with the same ingredients except for the scent. However, we will be replacing the men’s and women’s deodorants with a collection of 5 scents – Original (formerly women’s with lavender and lemon), Timber (formerly men’s with clary sage and W. Indian Sandalwood), Vanilla, Geranium and Serenity (spa-inspired). How does your detox masque kit work? Why is it important? Many people are hesitant about switching to a natural deodorant because of the infamous “detox period”. Our Underarm Detox Masque is a charcoal mask with the power of pure clay and apple cider vinegar that helps ease the transition to natural deodorants and maintain healthy underarms. It is ideal for those looking to switch to a natural deodorant, whose natural deodorant is not as effective as before, or whose underarms look dry, flaky or discolored. What is next for SWAY? We are launching a whole line of skincare products made with natural ingredients, #BoostedBySWAY and also many unique and chic beauty accessories.